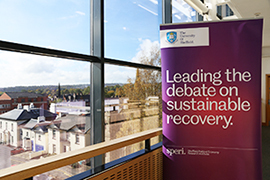 The University of Sheffield is seeking on behalf of SPERI to appoint a new Chair in Political Economy and Co-Director of SPERI from 1 August 2017. Applications are welcome and informal conversations can be held with Professor Colin Hay at c.hay@sheffield.ac.uk. SPERI has been co-directed since its establishment in 2012 by Professors Colin Hay and Tony Payne. Tony retires as Director of SPERI on 31 July 2017, but will remain a part-time member of SPERI’s sfaff as a Professorial Fellow for a further period of time. We are looking for an inspirational leader, who, working with the other members of the leadership team in SPERI, can provide the intellectual and strategic direction to meet our ambitions for SPERI. A full description of the post can be found here. The closing date for applications is 20 April 2017. The reference for the post is UOS015732.